Consumer News Television began because small companies could not get TV exposure or online publicity with their limited budgets. Every guest on our show is now part of our network, and CNTV is just one of many marketing opportunities. we contact you and let you know why it is a great deal for the money! That is why we created Referral Rewards! Simply share your CNTV feature with another business owner and explain that you have nominated them to be on our show! If we approve their business, and they book an interview... You get the marketing opportunity that we offered you-FOR FREE! CNTV will even create the Forward-able email with video player embedded for YOU! You now have NO EXCUSE for not marketing your company and CNTV feature at the same time! 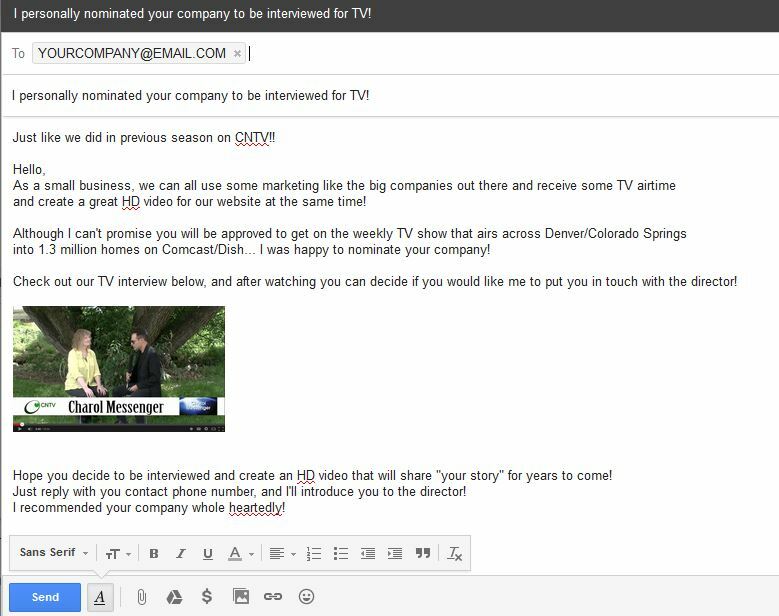 Simply reply back to CNTV with 2 businesses you have in mind to share with... and we'll create the video player email that you can edit to your liking! If you would rather download your email contacts, and have us email the nomination email above... just let us know, and we'll send instruction on how to download you contacts to us! Either way... Further Free marketing... AWAITS YOU!